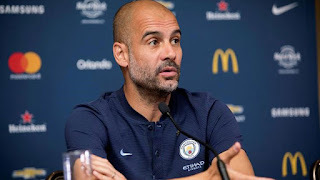 Manchester City coach, Pep Guardiola, will put squad rotation ahead of rewriting the European football history books when runaway Premier League leaders Manchester City visit Newcastle on Wednesday. Guardiola’s side crushed Bournemouth on today to make it 17 successive league victories, two short of the current record for the top five European leagues, set by Bayern Munich during the current City manager’s reign with the Germany club. But as City continue to battle for silverware in four competitions, and negotiate the gruelling fixture schedule over the Christmas period, Guardiola is more interested in making sure his stars keep up their intense style of play than in setting new records. “Fatigue, I don’t think it will be a problem. It may happen but we’ve a good enough squad,” Guardiola said. “Gabriel (Jesus) didn’t play against Bournemouth – he played 120 minutes against Leicester (in the League Cup) and he’s the best fighter in the high pressing I’ve ever seen in my life. He helps us a lot with our intensity. “Danilo, Bernardo, (Ilkay) Gundogan all helped us against Bournemouth. We have Yaya (Toure). “Last game, (Oleksandr) Zinchenko was man of the match and he was not in the squad against Bournemouth. Nevertheless, the fixture list has been relatively kind to City in terms of quality of opposition over Christmas and New Year, with the Newcastle game followed by a visit to Crystal Palace and home meeting with Watford – all clubs struggling for form. There is the real prospect that by the time City visit Liverpool in mid-January, they will have broken the record and have 20 straight league victories – not that Guardiola is motivated by the prospect. “All it means is we’ve won a lot of games. Since August we have won a lot of games and that’s why we are happy,”he said. “Our lives are better when we win, it’s simple like that. But I’m not going to sleep thinking about if I am going to break a record from my time at Bayern Munich. It’s nothing special. “It’s about Newcastle. I could not see them over the last few days of this Christmas time.